Nacreous clouds are some of the rare cloud formations that have earned high regard among cloud spotters. However, frequent appearances of nacreous clouds in the sky worry scientists. Why? Read on to learn more. Nacreous clouds are polar stratospheric clouds that have shiny, beautiful colors similar to those found in a seashell. This is the reason why this cloud is named as the mother of pearl clouds. It is largely made up of ice crystals and despite its stunning appearance, nacreous cloud is a destructive cloud as it helps in destroying the ozone layer. 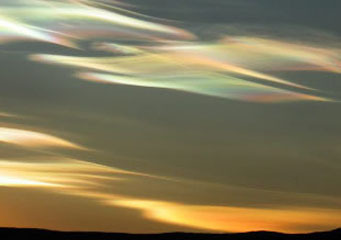 Nacreous cloud formations help speed up the depletion process of the ozone layer by providing an ice crystal surface so that chemical reaction between bromine and chlorine in CFCs (chlorofluorocarbons) can occur. The chemical reaction results to the release of Chlorine from the CFCs thereby contributing to the destruction of the ozone layer. This chemical reaction also eliminates nitrogen which aids in slowing down the damaging effects of bromine and chlorine on the ozone, hence, depletion of the ozone layer is made even faster with nacreous clouds. At What Height is Nacreous Clouds Found? These clouds develop on the second level of the Earth’s atmosphere, the stratosphere. Weather clouds develop at the troposphere which extends up to 10km from the ground, while the stratosphere extends up to 50km from the Earth’s surface. How do Nacreous Clouds Form? Nacreous cloud forms as a result of pushing up of ice crystals into the stratosphere. This occurs due to extremely strong winds and storms in the troposphere where moisture was able to penetrate at the very dry stratosphere. It is largely composed of similarly-sized ice crystals which produce bright, glittering characteristics. Nacreous clouds are classified based on their chemical structure. This cloud is composed of water and nitric acid and is characterized by less dramatic and fewer bright colors. Type Ia cloud contains crystals which are the by-product of water and nitric acid. Type Ib cloud consists of small globular droplets from the mixture of sulfuric acid and nitric acid. Type Ic cloud holds small, non-spherical droplets of metastable nitric acid. Type II clouds enclose ice crystals and exhibit a very spectacular appearance. What do Nacreous Clouds Look Like? Nacreous clouds appear like sparkling seashell in rolling sheet-like patterns, revealing the waves and winds in the stratosphere. Little by little, the floating sheets stretch out and match the semi-dark sky. Their magnificent, dazzling, shimmering color and relatively slow movement make for a very wonderful and memorable sight. How common is Nacreous Cloud? This cloud formation is usually seen within a couple of hours before dawn or after sunset during the winter months. They shine incredibly bright, with vibrant and gradually shifting, glittering colors. Nacreous clouds are seen in high latitude regions during the winter season like in Alaska, Iceland, Scandinavia and England. Certainly, nacreous clouds are very rare and awesome cloud configurations. But despite its spectacular appearance, nacreous cloud is a truthful reminder that the ozone layer is being destroyed and needs immediate action.